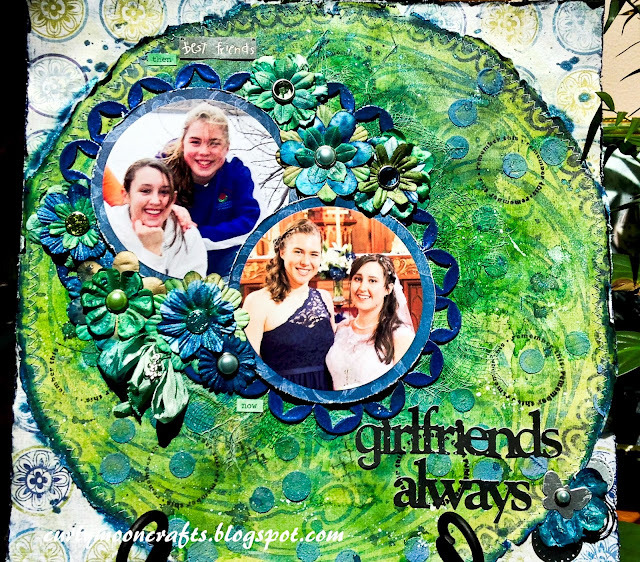 Hi Friends: Today's 2nd post is a mixed media layout of my daughter and her best friend, both then and now. As I look through the layouts I've posted, I'll bet anyone can guess my favorite colors - I'll have to move out of my comfort zone and start using other colors. LOL. But I thought it was interesting how Jenny and Bethany are both wearing the same colors in the 2 different photos. Please see below for photos, process, challenges, and supplies. Hope you had a great weekend! I started with some MME papers that had circles in them and contained blue colors that were in the photos. I tore the edges of the green, large circle paper, distressed the edges, and layered it over the blue background paper, then I stitched the edges of the circle with my sewing machine. I prepped the green circle with clear gesso, dried it, then added embossed circles with a circle stencil and embossing paste that was colored with Chipped Sapphire Distress Stain. I added some cheesecloth and lots of shimmery color to the background with several colors of Lindy's Stamp Gang sprays (see below), and let the colors drip and move around the embossed circles. I added some interest with Jet Black archival ink and some circle and wire net stamps. 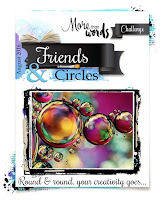 I cropped my photos and the mat paper with my nested circles Spellbinder's die, distressed the edges, and layered them over scrap cardboard to lift them up off the page. I used the Courtyard frameworks to cut the circles from Grungeboard, then embossed them using Versamark ink and LSG embossing powders. I cut the framework into individual circles and layered them around the pictures. I colored some Prima flowers and crinkle ribbon with the same colors of LSG sprays. Once dry, I layered the flowers and added brads to the centers and arranged them around the photos. I added a charm to the ribbon and tucked it into the flowers. For the title and accents, I found some "friends" metal words in my stash and glued them to the page. I used some Chit Chat stickers for the words "then" and "now" and colored them with the LSG sprays. I added some round metal charms, a round paperclip, and a flower to the bottom corner to finish off the page. Finally, I used white gesso and some of the LSG sprays to splatter drips across the page. I love your choice of colours Patti, just perfect for your photos too. Great mixed media background. Love the whole "then & now" theme, just perfect for our challenge. Thanks for playing along with us at More Than Words. Oohh the colours in this are fabulous! I love the photos too. Thanks for joining in at More Than Words this month. Great take on the challenge Patti! So glad you were inspired to create and share your process with us. Thanks for playing along with us at More Than Words. Your background work gave a really interesting and different outcome !! It looks amazing !! Thank you so much for joining us at More than Words !! Love all your circles! I love that you cut your pictures in round shapes also! Thank you for playing along with us at More Than Words!